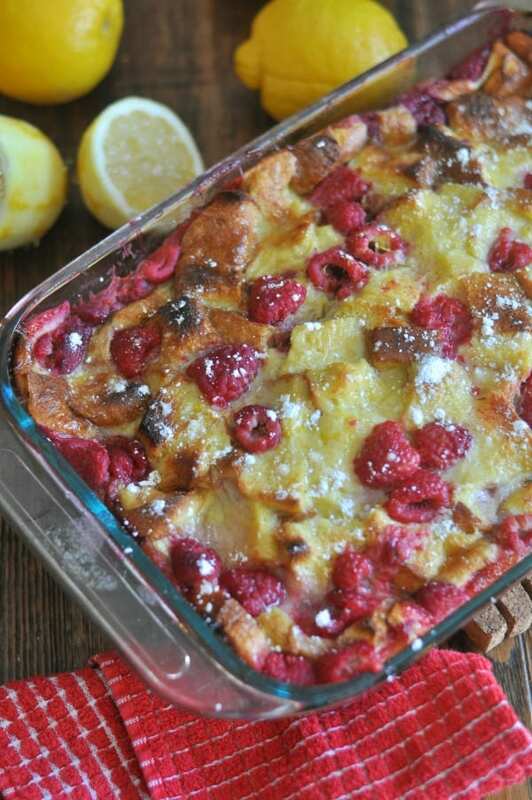 This Lemon Raspberry French Toast bake calls for simple ingredients that add to the wow factor of the dish. 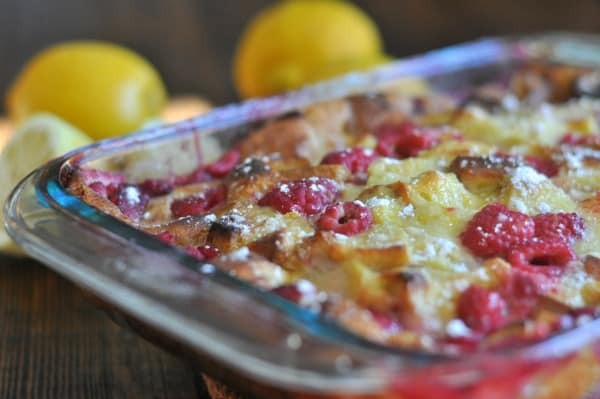 When my husband tasted this Lemon Raspberry French Toast Bake, he said, “That breakfast is off the hook.” BTW, my husband is totally stuck in the 1990s but I love him dearly. I also make a Blueberry version (I could totally eat this right out of the pan it is so good) and it receives similar raves from people when I make it. 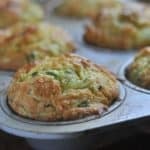 How simple is this recipe? It is so simple to prep everything and I usually get my kids involved because they love to crack eggs. So I’ll get the bread cubed up (or they do that too) and I have them crack one egg at a time and then run the blender. So not only does this dish give you some extra time with your family, it is a great dish to make together because it is so simple. 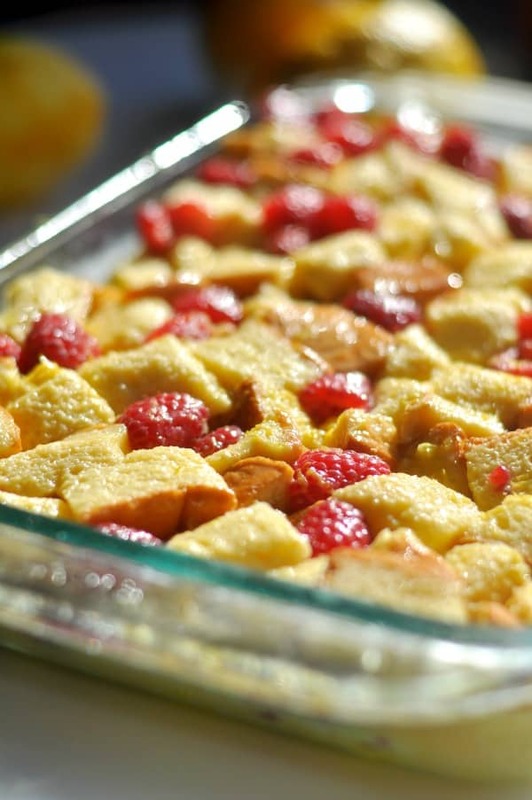 The Lemon Raspberry French Toast Bake goes in the oven for just under an hour. 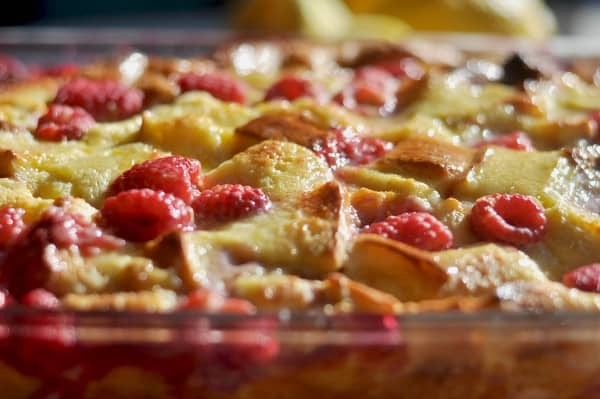 I think it is a perfect dish to bring for bridal or baby showers, playdates, brunch, family gatherings or a holiday celebration because it is so simple and always wows a crowd no matter the season. 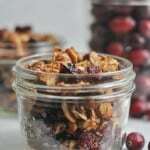 It is simple enough for a lazy weekend morning and tastes fancy enough for a party or holiday celebration. 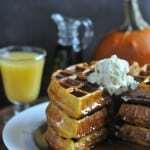 I would totally make this for a holiday morning when I love something yummy and cozy but not too complicated. 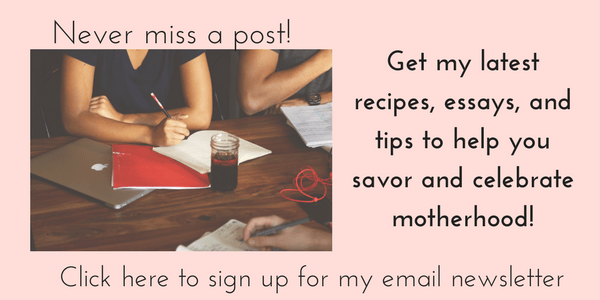 Also, if your family is looking for a recipe they could make for you for Mother’s Day, they could totally handle making this for you! 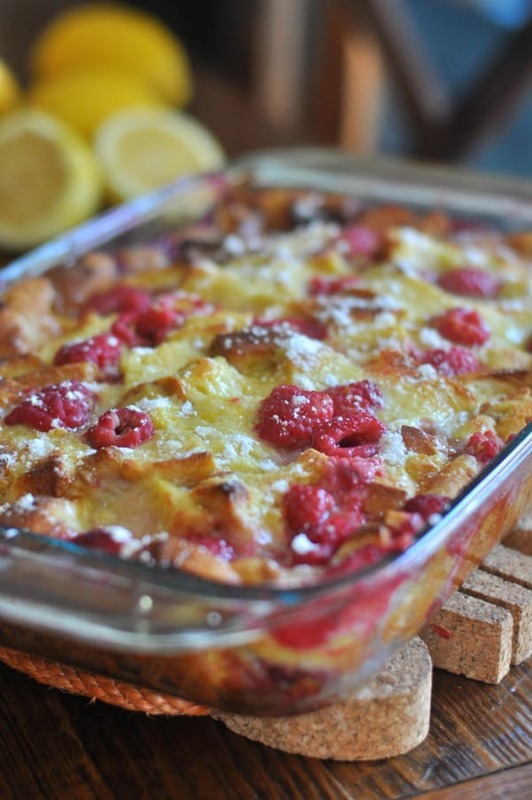 Once the Lemon Raspberry French Toast Bake is out of the oven, I brush it with some butter and give it a nice dusting of powdered sugar. 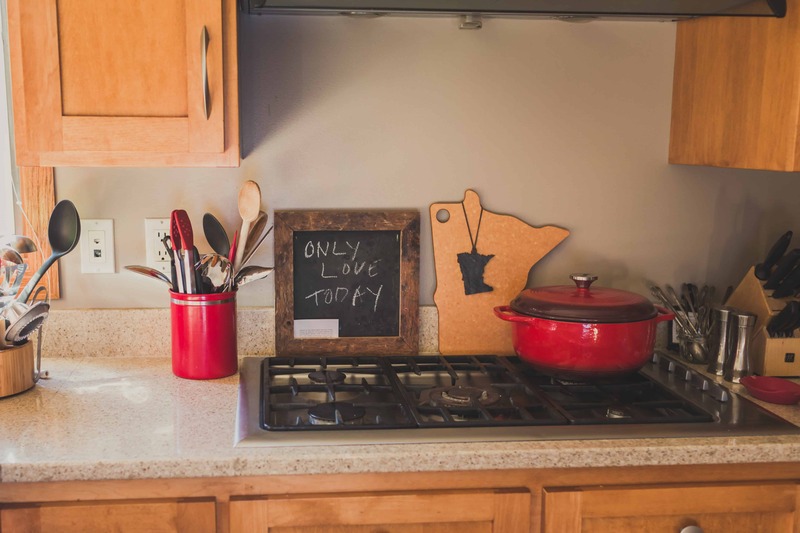 When it’s just our family, I’ll cut a few pieces out of the pan and tuck it away for school lunch or pop it in the freezer for a future meal. 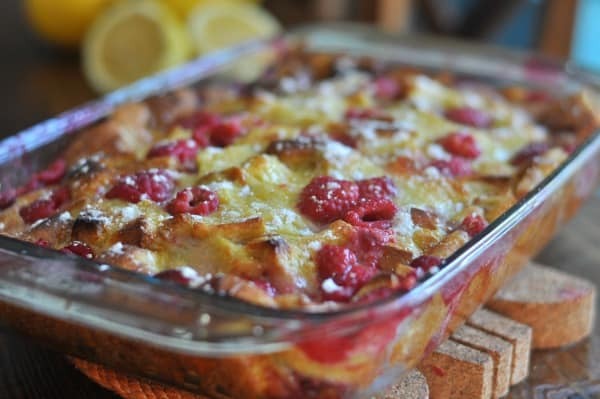 This Lemon Raspberry French Toast Bake makes a yummy soft breakfast casserole and I like to let it cool down a bit before I slice it up. I hope your family and friends enjoy it as much as we do! 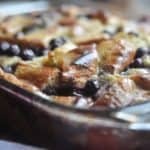 Use Brioche bread, it is perfect for french toast. Can’t find it? Check the bakery of your local grocery store or call your local baker to see if they carry it. I get mine at Aldi. I love Almond Milk because of the protein and flavor. 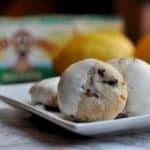 You could substitute half and half and add 2 tsp of Vanilla for the Vanilla Almond Milk in the recipe. I like using a blender to blend up the eggs, maple syrup, Almond Milk, and extracts. Play around with different fruit. 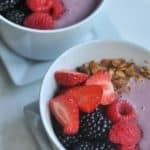 You could add Blueberries instead! This is freezer friendly and makes a good meal for a future weeknight (breakfast for dinner). I like to let mine cool for just a bit right out of the oven but you can totally eat it right away! It will be softer right out of the oven. Spray a 9x13 pan with non-stick spray. 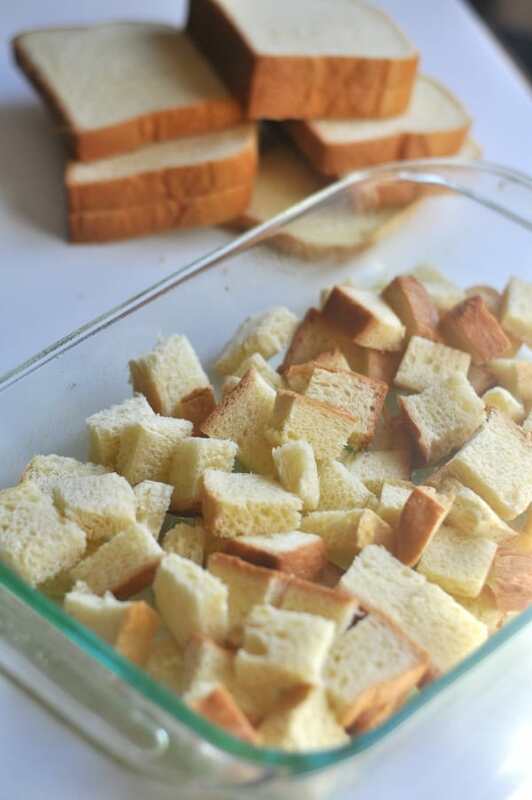 Cut the bread into small cubes. Put half the bread in the pan. 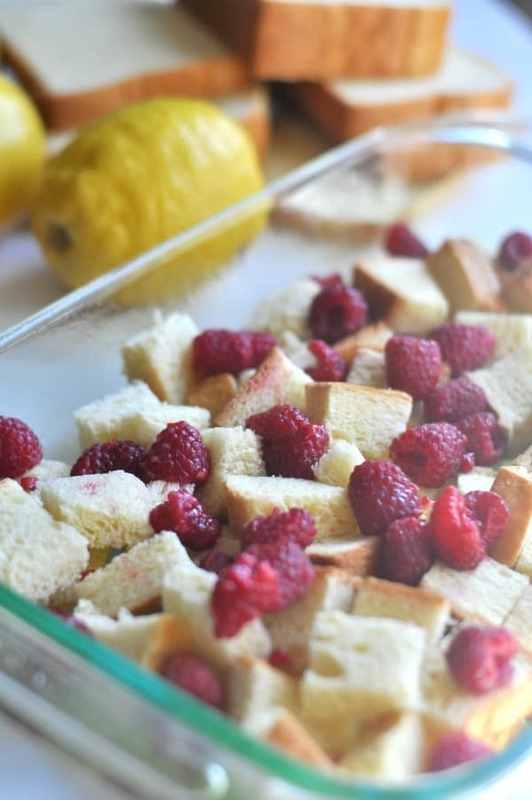 Sprinkle the bread with half of the raspberries and zest from half of the lemon. 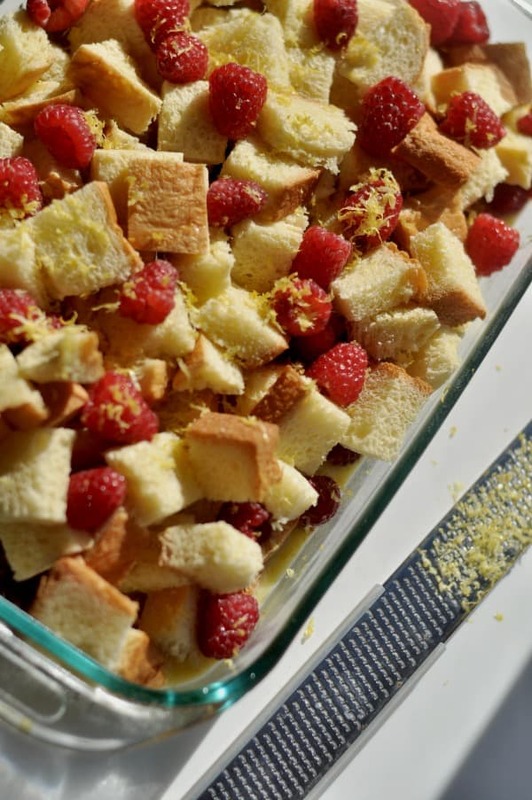 Then top with the remaining bread, raspberries, and the rest of the lemon zest. Crack eggs one at a time into a large glass measuring cup and then add to a blender. Then to the blender, add the almond milk, maple syrup, lemon extract, and almond extract. Blend until combined. Pour the mixture on top of the bread and raspberries. Press down with your hands to ensure bread has soaked up the mixture. Cover the pan with tin foil. Bake 40 minutes. Take off the tin foil and return the pan to the oven and bake 15 more minutes. Once baked, brush with melted butter and sprinkle with powdered sugar. Serve with maple syrup. 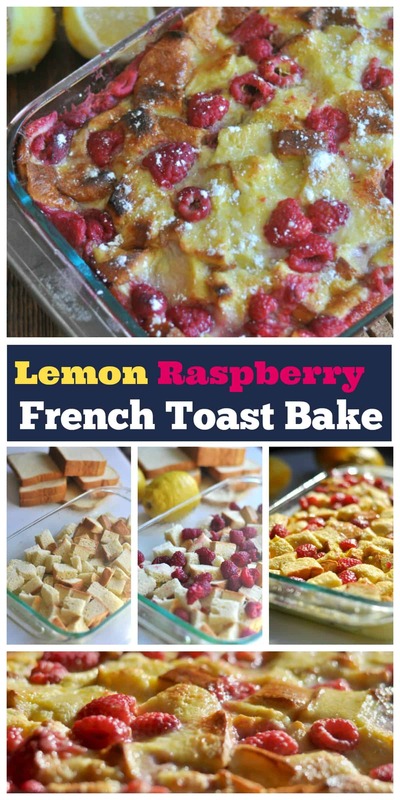 This entry was posted in Breakfast and tagged breakfast, french toast, lemon, mother's day, raspberries, raspberry, shower, spring by Alice Seuffert. Bookmark the permalink.